Heads-up: This post is detailed and comprehensive. These links jump you to the major sections if desired. If you don't know what note links are, you are under-utilizing Evernote and this post has the potential to transform your understanding of what is possible with Evernote. Note linking is the single skill that converted me from casual Evernote user, to an all-in Evernote zealot. Why? Because note links create structure in Evernote, which, by design, is an unstructured and flexible platform. And this structure is a key aid in me being able to quickly navigate to what I am looking for, no matter where I’m accessing Evernote from. In short, note linking makes stuff easier to find and they are an essential part of my overall Evernote organization. I love note linking, because it gives me a layer of structure to my notes that is completely in my control - letting me connect any two arbitrary notes together via a hyperlink. By using note links, I create logical “bread crumbs” between my notes that brings a hierarchy to my data and supports my efficiency. The speed of navigating to notes is also a factor in my love of note links. With a single tap on my mobile screen, or a single click of my mouse, I’m taken to the related note. This is more efficient than doing a search into the search box or navigating through stacks and notebooks to get to a single note. I tend to use note linking most often in internal task management and is a core skill that supports my ability to do 100% of my task management in Evernote [a topic for another post]. You can see exactly where note linking fits into my Evernote organization by reviewing my post on the spectrum of tools Evernote provides for organizing your account. That post is a high-level overview of the organizational categories Evernote offers. This post takes a deep-dive into note linking, which is a single feature from the third broad category presented - Evernote navigation features. What exactly are note links? "A Note Link in Evernote is like a URL, but instead of referencing a unique web address, it references a unique note in Evernote. Creating note links currently only works from within the desktop clients. But once the links are created, using those links works from anywhere you can access Evernote." More "techie" explanation: Each note in Evernote has a unique ID associated with it - kind of an internal permalink - that is a unique identifier for that note. This is a behind-the-scenes thing. We don’t really see it as an Evernote user, but, this unique note ID is what gets copied and utilized when you create note links between notes. Understanding this concept quickly elevates your understanding of this Evernote feature and helps you apply it in support of your productivity. From basics to advanced, there are a few things to understand about note links that make for successful use of them in your account. For clarification on any of these, leave a comment on this post. Note links are different than public links which is a separate Evernote feature. Similar terminology, but very different features. Be sure you are using the right feature! You can only link notes together, not notebooks or stacks. You must be on the Windows or Mac desktop version of Evernote to create note links. 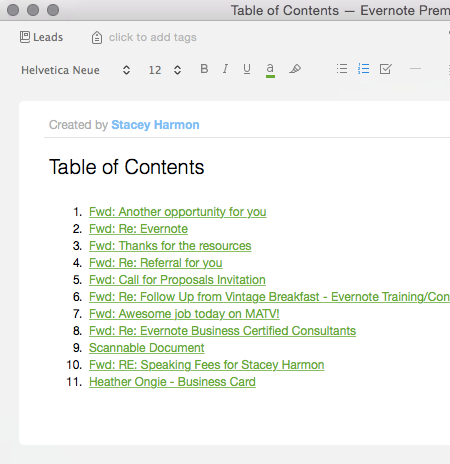 However, once created, note links can be accessed in all versions of Evernote. Note Link Text: The note text that becomes a hyperlink to your destination note will not be updated if you change the note title or text in your destination note. If you want the note title to be updated at your link, you will need to manually update the text - either by re-creating the note link or manually updating the text that is linked. There are use cases where you may want to change the destination note title and not have the note link text change. The key is to understand the feature behavior so you can appropriately use it to suit you. In Evernote Business: A destination note is moved from personal to business [or vice-versa]. This process puts the note that lived on the personal side of an account in the trash and creates a new, copied note on the business side of the users account. This action will break any note link that was previously set to the note on the personal side of the users account. The lesson here is don't create a link heavy structure/workflows in the free, plus, or premium version of Evernote then expect it transfer over to Evernote Business when you upgrade. You'll need to create [or re-create] any note-link structure or workflows natively in Evernote Business for it to work. Both of these will add the note link to your operating system clipboard. Step 2: Navigate to the note you want to have the hyperlink in, put your cursor in the body of the note where you want the note link to appear, and Paste [either Command + V, Edit > Paste from the menu, or Right Click > Paste]. The title of the note that you are linking to will now be listed as a green hyperlink to that note. Table of Contents Feature: If you have several note links you want to create at once, Evernote provides two notable ways to do this. The first is by using the Table of Contents feature. A very practical use case for note linking is to create a table of contents note that links to supporting notes in a project notebook. You certainly could build this out one note link at a time using the technique above, but using the Table of Contents feature in Evernote is far more efficient. To use this feature, simply select all the notes that you want to have included in the Table of Contents from the middle note panel. When you do this, an option to create a Table of Contents note will appear in the right hand pane of your Mac or PC Evernote app. Select this button, and wha-la, you’ll have a new note in the notebook that contains an individual link to every note you had selected in the middle pane. The note is automatically titled “Table of Contents”. Optionally, you can rename the note, and use a non-dated reminder to “pin” the note to the top of the notebook list. This is a common tactic I use to create easy navigation within my Evernote project notebooks. Batch Action: It is possible to create multiple note links at once by selecting multiple notes from the middle panel, then right clicking and choosing “Copy Note Link”. When you paste, individual note links to each destination note will be created. Alternatively, you can also select multiple notes in the middle note panel, right click [with the notes selected] and choose “Copy Note Link”. This will copy the note link for each selected note to your clipboard and you can then paste that list of note links into an existing note [it doesn’t create a new note as Table of Contents button does]. This variance puts you in control of where you paste the note links and allows you to utilize an existing note as a hub to other related notes. This is a tactic I often use with template notes, say, with my lead template, where I have contact information at the top of the note, and then want to link to various email communication notes that I have retained in a notebook so that I can quickly access the communication history with a lead. The above information is the foundation you need to get value out of Evernote note links. The following tips will enhance your skill level with Evernote note linking and quickly skyrocket you into power-user status. After you hyper-link to your destination note via a note link, quickly return to the last note you were at by clicking the back button in the Evernote app window. It functions just like the back button in your web browser. It’s quick, easy, and very useful. The note linking techniques taught above show how note links typically paste the name of the destination note as the hyperlink. However, it is possible to use the note linking feature to convert any text you’ve typed in your note into a hyperlink to another note. Efficiency Bonus: There is a key command for step 3. This is one of my most frequently used key command shortcuts. It takes me only a second to do, and I do it multiple times a day. It is super efficient because you don't have to take your hands off the keyboard for step 3, and it is one of my absolute favorite Evernote time saving features. By taking the note link that gets copied to your clip board, and pasting it in 3rd party applications such as Outlook Calendar, Google Calendar, OmniFocus, your CRM, etc, you can link back, and easily access, supporting notes that live in your Evernote account. There are many applications that support this feature. Try it out. It's amazingly useful. Regardless of which method you use to create multiple notes [table of contents or batch], your multiple note links will be created in the same order that the notes are appearing in the middle preview pane. So, if you care what order the note links are created in, manipulate the view order of the notes in the middle preview pane before you select the table of contents button or right click to copy multiple note links. You can do this by changing the sort order to the notes in the middle column. And, if a date or title sort isn’t the order you want, you can rename notes in a way that forces them into a certain order on an alphabetical sort [use the strategies I detail out in this post on naming the gaming]. Since by default, note linking pastes the title of the note as the hyperlink, users who focus on note naming conventions can boost the effectiveness of their table of contents notes and pasted note links. When the note title has a descriptive name, you get meaningful information at a glance from your note link, and this can certainly help your note links to have more human value and organization. Note linking is powerful. If you've made it this far, I trust you can now see why. My hope is that this post has expanded your ideas about what you can do with Evernote and you are having some “light-bulb” moments about how Evernote can better support your productivity in a digital age.